Detail : Paul's twenty first solo single. 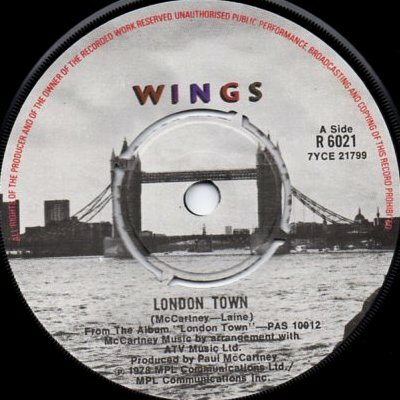 Credited to McCartney-Laine, this was written by Paul and Denny in Perth, Australia during the Wings World Tour of 1975, and recorded back in London. The B-side (recorded in the Virgin Isles) was done in a single take and features Paul playing a "Gizmo" ... an instrument invented by Godley and Creme (ex-10cc). The single was a track too far from the album though, and failed to make much of an impression on the chart. The single was not released in a picture sleeve, but had the London Town labels again, and again black-and-white on the front, colour on the B-side. This time it's "MASTERED AT ABBEY ROAD" on the B-side run-out, and "NICK" on the A-side.